New research suggests the depth of the problems some vendors claim with the G-Cloud. But is the lack of good fortune that seems too common on the framework not really the government’s fault at all? Hi, Chris – so what have you discovered? We knew there was a lot of dissatisfaction with G-Cloud, but we wanted to know what the real source of that was. To do that, we worked with a partner of ours, Lindsay Smith of G-Cloud Sales, which has been doing some real number crunching. And we’re both pretty shocked by what came out of the data – which is to say, the government’s own data. It’s eye-opening, genuinely. 80% of Software as a Service (SaaS) companies on the Marketplace are not making enough sales to justify their presence on it. Wow, that’s pretty scary. What’s your basis for saying that? If you aren’t making £100,000 of annual sales off a channel per year, you can’t justify the cost of a full-time professional sales expert. And 80% of companies on the Marketplace, which is to say cloud firms simply aren’t making that in sales. That’s really not very good. Is it the government’s fault? A lot of people say that the Marketplace isn’t set up well and is too hard to get on to in the first place. I just don’t agree. For a start, the barriers to entry to the Marketplace, which is just a special form of commercial framework, are very low compared to other government procurement set-ups. I actually think GDS and CCS have done a good job here. Again, that’s just not the right way to look at this. I said that the barriers to entry to the Marketplace are low, which is the right way to do things as the government has been very consistent about encouraging wider participation in the supply chain for public sector ICT. But the problem with that is that, even now, with G9 coming up, suppliers are just not ‘getting’ what the Marketplace is all about. It’s been going for six years! Really? Don’t be unfair to suppliers here. What they don’t know is the sector and the way it works in enough depth. We do a well-regarded training course for techUK, for example, for really great sales professionals – and every time we start the sessions, we still find real gaps in knowledge about what the customer is really looking for. Not enough is being done – by both sides, really – to do all the checks and run the metrics to ensure the services up there really are displayed in a way that makes the job of buying easy and straightforward enough for the market out there. I think what we’re really learning is that it’s still hard not just for first-timers with all the admin to get it all right, but even experienced vendors can take two or three go-rounds on various iterations of the Marketplace to get rolling properly. Such as? What sort of gaps? Incorrect pricing; description of services not being detailed enough; terms and conditions being unclear or incomplete. There are lots of detail issues that people are letting themselves down on. Two things. One, we’re working with G-Cloud Sales to distill the knowledge out of all this into a structured set of resources we’re putting on our web site. The aim of that is to provide best practice guidance on what being on the Marketplace really involves and it’s going to be available – for free – of our website. I should also say there’s some great free, public guidance to add to that from GDS itself, in the form of its Buyers Guide, and there’s the public G-Cloud sales database itself, of course, which are both always keeping tabs on. Two, we’re doing as much market education as we can – of which this interview is part, but we have a rolling programme of information sharing for suppliers. That’s going to include some very detailed webinars next month, for example. Sounds useful. But is it too late for the Marketplace and all those firms not getting any success out of it, do you think? Not at all. The Marketplace is a great selling mechanism. 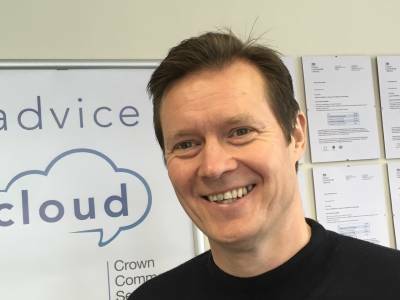 The challenge we and G-Cloud Sales have crystallised here is the need for tighter control of the compliance side but also a bit more work on your sales proposition and marketing. All that’s eminently fixable, and there’s fantastic opportunity for the suppliers who just do a bit more to help themselves. The bottom line here is that the Marketplace isn’t broken at all, it’s just that we need to really understand as suppliers what its role really is. It’s a great time to be in this market, so let’s help you make the most of it! Thanks Chris, really interesting work.